From the period of 1813 to 1835, among those who discovered and explored the area of NSW referred to as The Central West Slopes and Plains (which includes Parkes) were George Evans, John Oxley and Major Thomas Mitchell. John Oxley was appointed Surveyor General of New South Wales by Governor Lachlan Macquarie in 1812. In 1813, George Evans, as deputy surveyor of lands, was recalled from Van Diemens Land (Tasmania) to Sydney, to try and find a passage into the interior of New South Wales. Once the Blue Mountains had been crossed in 1813, and the town of Bathurst established, the colony wished to expand. Wool had become Australia's first main industry and more grazing land was needed for sheep. In May 1815, Evans, leading a party of five, travelled over 100 miles to the west of Bathurst, where he discovered a river flowing to the southwest. He named this river the "Lachlan", after Governor Lachlan Macquarie. Hear me read the text above by clicking the play button. Hear me read the text below by clicking the play button. In 1817, under the Governors' orders, Oxley led an expedition to follow the Lachlan River. Evans was second in command to act as a guide to the new area which he had found two years previously. Oxley surveyed and mapped the river and found good grazing land to the west of Bathurst. While exploring the Lachlan River, he noted and named (in the distance), two prominent features of the district: Croker's Range (native name Warree - now known as the Bumberry Ranges), east of the present location of Parkes, and to the north east - Hervey's Range (native name Goobang, which is derived from the Aboriginal Coleong Coobung, which meant place of many wattles). Following the river downstream past the present site of Forbes, Oxley found that it flowed into marshland. Unable to proceed further, he decided to strike out for the South Australian coast. Shortage of water forced his return to the Lachlan, which he rejoined below the marshes previously encountered, but only to meet more marshland further on. Oxley decided to turn back and, leaving the Lachlan, crossed the Bogan River and followed the upper waters of the Macquarie back to Bathurst. Mitchell came to Australia in 1827, to take up the role of deputy Surveyor General, and upon John Oxley's death in 1828, he took over the role of Surveyor General of New South Wales. Mitchell continued in that role for 27 years, where he undertook 4 major exploration expeditions. During his second and third expeditions, he passed through the Central West region. Mitchell set out on his second expedition on 7th of April, 1835 from Boree Station, approximately 30 kilometres west of the present site of Orange. His intention was to explore the Bogan River including as much of the Darling river as practical. Three days after starting out, Mitchell's party camped near the Goobang creek, at a point within a few miles of the present location of the Parkes Radio Telescope. Nearby, Mitchell met up with some local aboriginals that belonged to the Wiradjuri tribe. This was the largest tribe in the state, which ranged from Albury on the Murray River in the south to near Coonabarabran in the north and covered approximately one fifth of the state. On the 17th of April, Richard Cunningham, who was the botanist with Mitchell's party went missing. After exhaustive searching which included the sounding of rifle shots, Cunningham was unable to be found. The party regrettably had to continue on without him. Today, there is a marker which shows the approximate location of where he went missing. It was later discovered he was killed by a local aboriginal tribe some 100 kilometres away - they had mistaken him for a mad man, due to his agitated state. On his third expedition in 1836, he passed through the area again while mapping the Lachlan River. Panorama Of Parkes - 1817-1977, by L.A. Unger. Published by Parkes Historical Society. 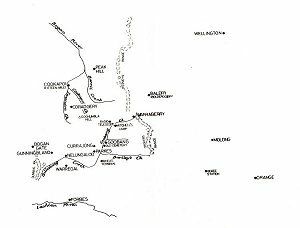 Three Expeditions Into Eastern Australia, by Thomas Mitchell.